Today's #SunsetSunday is a similar post to something I posted a week and a half ago. But the scene was so spectacular that I felt the need to share another view, because the coming together of these elements was a rare congruence of photographic perfection. Rarely do I have the chance to catch positively heavenly-looking skies at the Happiest Place on Earth, and this was a product of fortunate placing. Had it been a different time of the year, the sun would have been farther south and well left of the frame. 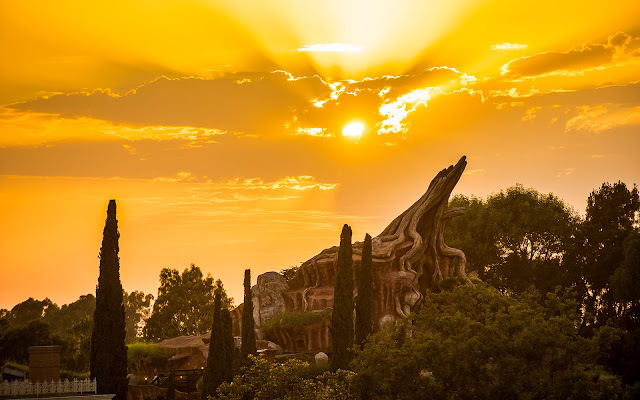 But here, the sunset seems to fall over the iconic Critter Country attraction--one of Disneyland's famous mountains, creating an almost ethereal scene. It's great when things come together, isn't it? Glorious sunbeams shine out over Splash Mountain.